Even if you didn’t think you had asthma or allergies, you might have noticed some difficulty breathing of late. Ever hotter summer conditions are sparking more and bigger wildfires that send smoke traveling further distances. Generally speaking, climate change has contributed to an increase in both allergies and asthma diagnoses over the past couple of decades. 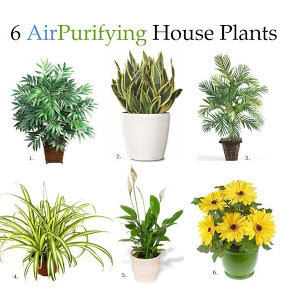 While possible solutions remain beyond the powers of any individual to solve, there is one way you can improve the air quality inside of your own home: houseplants not only emit oxygen but also absorb toxins from the air so you can literally breathe easier. This happens to be more cost effective and more environmentally friendly than investing in air filters or oxygen supplementation. The plants absorb and offset indoor polution emitted by air conditioning, appliances and synethetics in your home. While oxygen production is common to all plants some species of plants are more productive than others. And while all plants absorb carbon dioxide in order to create oxygen, some species also absorb additional toxins from the air like ammonia and formaldehyde. All it takes to feel an improvment is placing about one plant every 100 square feet in your home, in pots that are six to eight inches deep, according to research by NASA. It’s up to you whether you want to bring home grown plants or start out by planting seeds in pots, which is the cheapest option of all. However, fully grown plants start improving air quality sooner, and are still cheaper than an electronic air filter. Below is a list of the species that produce the most oxygen and are relatively easy to maintain compared to other varieties. Garden mum: NASA research found that this flowering plant has the strongest air purification abilities of any other. It remove sammonia, benzene, formaldehyde, and xylene from indoor air. Spider plant: One of the easiest to grow on this list, the spider plant is ideal for beginners and forgetful types, and does best in bright, indirect light. Ficus: Also low maintenance — as long as your remember to let the soil dry out between waterings — it can actually grow up to 10-feet tall indoors, and can even go outdoors during summer months. Bamboo palm: Thriving in bright light, this plant can grow up to 12 feet tall and is pet friendly. Boston fern: Make sure this plant’s soil is always moist and place it in indirect light, and this plant is easy to grow. Snake plant/mother-in-law’s tongue: This might be the hardest plant to kill out of any on this list, as it needs somewhat less frequent watering. Aloe vera: In addition to being easy to take care of, this plant has extra health benefits — inside of the leaves, a clear liquid full of nutrients can heal wounds, treat inflammation and even act as an antibacterial. The abundant benefits of these plants make them pretty popular and thus easier to find at garden supply stores. You might find that once you add more greenery to your home, it will feel better to be indoors. These are good choices of houseplants.